Kirk Douglas will receive the Jewish Film Festival's Freedom of Expression Award this Sunday at the Castro Theatre. San Francisco's Jewish Film Festival, which opens tomorrow night at the Castro with the award-winning family drama Mabul and a post-screening bash at Café du Nord, will present its Freedom of Expression Award to Kirk Douglas on the Castro stage this Sunday in celebration of the 50th anniversary of Stanley Kubrick's Spartacus and Douglas' proudest professional achievement: breaking the Hollywood blacklist. Douglas (born Issur Danielovitch) bravely crossed the Hollywood blacklist when he insisted on giving a screen credit to blacklisted screenwriter Dalton Trumbo for Spartacus, which Douglas starred in and produced. Though the decision was widely criticized at the time, Douglas, 94, is now celebrated for his role in ending the legacy of the McCarthy era in Hollywood. 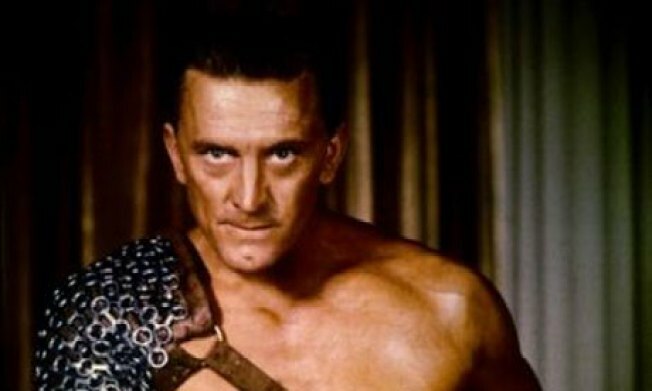 Douglas will appear Sunday at the Castro to receive the award and to introduce a special screening of Spartacus, Kubrick's epic historical drama about the legendary Thracian slave who leads an uprising against Roman general Marcus Licinius Crassus (Laurence Olivier). Adapted from a novel by fellow blacklisted writer Harold Fast, Trumbo initially wrote Spartacus under the name Sam Jackson, but it was Douglas who insisted against the use of a pseudonym. Throughout the '50s, McCarthyism and fear of Communism prevailed in America, and the blacklist prevented filmmakers, screenwriters and actors suspected of having ties to the Communist party from working in Hollywood. The blacklist era is now regarded as one of the darkest chapters in American political and media history, one that had a profound impact on the lives and reputations of many Jewish artists, including Douglas, working in cinema. “We feel that Kirk Douglas is the ideal recipient for this year's award, and we can think of no better film to present in the context of Freedom of Expression,” Festival Program Director and former Freedom of Expression Award-winner Jay Rosenblatt says. “It will also be an interesting experience for our audience to view Spartacus within the context of a Jewish film festival. Spartacus is the story of slaves freeing themselves from the Romans. That has particular reverberations for Jews familiar with the Passover story of deliverance from slavery in Egypt." Spartacus arrives at the Castro Theatre this Sunday, July 24, at 1 p.m. For tickets and more information, visit the Jewish Film Festival's official site.